Demidov's work. Chronology of events. 1719 December. 10 Peter the 1 issued an Edict that established the Berg - College ( the Central Mining Board ) and gave advantages to "all those who are fond of mining". The Edict allowed "everybody...of any rank...to search, melt, found and scour any metal everywhere". 1719 Miners with Stepan Grigorievich Kostylev at the head discovered a deposit of copper ores in the Altai Mountains near the upper Alei for the first time. They failed to avail themselves of their discovery. 1720 spring An experienced "assay-master" Jogann Frederic Bluer smelted the first copper out of Altai samples. 1725 The first ore-prospecting expeditions was sent by Akinfy Nikitich Demidov to work in Altai. Its participants supplied the ural factory - owner with samples of ores from rich deposits situated in the basins of Charysh and Alei Rivers. February. 16 Akinfy Demidov received a Berg - privilege that is a permit for mining and melting of Altai copper ores "to the state glory and national profit". 1726 February Ivan Slatter, a founder, a famous metallurgist, smelted the first silver from the ore supplied by A. Demidov. 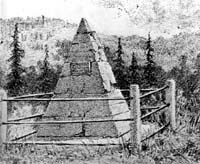 spring Sent with Dmitry Semenov at the head to Altai, Demidov's masters built the first furnace and carried out a test melting of copper ores. of the Demidov first factory in Altai The Kolyvano - Voskresensky Works was built under the guidance of Nikifor Kleopin in the place of the test melting. It was the first metallurgical works of A. Demidov in Altai.The whole production was situated in a small house where was the only furnace for copper melting. A new metallurgic works named Kolyvano - Voskresensky started working on the river Belaya 5 km far from the first one. This is the largest Altai works of A. N. Demidov. 1737 The Kolyvano - Voskresensky Works and Altai mines of A. Demidov were taken under "public support" and controlled by a state comissioner. 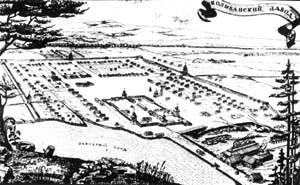 1744 The Barnaul copper-smelting works was built. Later it turned into the centre of mining industry in Altai. The city of Barnaul originated from it. Works in the mine. Fragment of a drawing ( XVIII c ). a silver, 69 copper, 6 lead, a copper-lead, 16 copper-bearing mines. 1745 Sent by the empress Elizaveta Petrovna a committee of mining experts with A. B. Beer at the head discovered rich reserves of silver ores in Altai.It was suggested that old plants be reconstructed, new ones be built and Demidov's works be taken under public support. May. 1 The empress Elizaveta Petrovna issued an Edict by which all Altai posessions of Akinfy Demidov's heirs were transfered to the empress's property and under the authority of the Cabinet of Her Imperial Majesty. "A. N. Demidov and Altai". In the foreground there is a model of the Barnaul Works of mid. XVIII c.
In the centre there is a gun from the Kolyvano - Voskresensky Works' fortress. In the background there is a drawing of the monument erected in the place of the Kolyvansky Works. 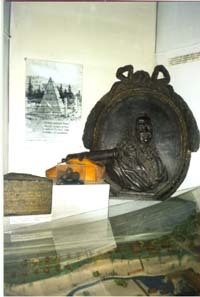 In the left there is a central stone from the monument.